In one sense, BioWare is moving away from the Neverwinter Nights franchise. They aren't planning any more expansion packs for the award-winning role-playing game, and they aren't even the developer behind Neverwinter Nights 2 (although I'm sure they'll have their hand in it). But Neverwinter Nights 2 is at least a year away, and meanwhile there is a dedicated Neverwinter Nights community. So what's a developer to do? In this case they've decided to take advantage of the game's powerful toolkit to release (premium) modules that can be downloaded for a modest price. So what does (premium) mean? It means at least four things: that BioWare thinks enough of the module to associate their name with it, that BioWare has tested the module to remove bugs and other sloppiness, that BioWare has added high quality production values to the module (such as new music and voice acting), and that BioWare plans to support the module and offer patches should they be necessary. In other words, premium modules should have the same quality as the campaigns BioWare has already released. On the downside, you're going to have to pay money for the premium modules, the modules are likely to be short so that they can be downloaded, and, at least currently, you're going to have to maintain an Internet connection when you play them so the game can authenticate your ownership every time you start the module or load a saved game. That last one is sort of nasty. Not only will the modules tie up your phone line if you're unfortunate enough to be stuck with a dial-up connection, but the authentications also add noticeable delays when you're playing the game (they take about 20 seconds for me). So these premium modules are no sure bet to be successful, and the three modules BioWare released on November 10 are basically trial balloons. If they work well (or at least make BioWare some money), then we'll probably see some more of them. Otherwise we'll have to find some other way to spend our free time. 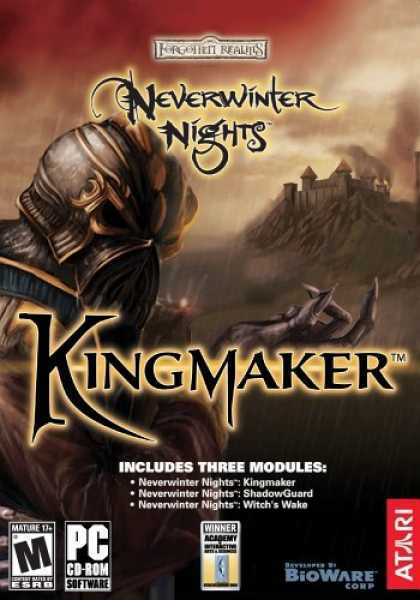 The premium module I'm going to review here is called Kingmaker. It requires version 1.64 of Neverwinter Nights, and it also requires the Hordes of the Underdark expansion pack. There are two versions of Kingmaker, a regular version and a (lite) version. The (lite) version doesn't include voice acting and some other bells and whistles, and so it is only a 10 MB download while the regular version is a 72 MB download. This review uses the regular version. The story behind Kingmaker involves you and a mysterious Masked Man. You and your four companions track him down to the Keep of Cyan, which he has put under siege. However, when you finally fight your way close enough to confront him, a wizard from the keep casts a spell that kills everybody on the battlefield, including you. Now, the premium modules are short, but they're not that short, and so soon enough you're resurrected. But your savior is a shaft of light, it seems to have plans for you, and it infuses itself into your weapon. Is the shaft of light good or evil, and what are its motivations? These are some of the things you'll discover in the module.